Farmers do not regard these wily creatures as friends, yet they are a delight to observe in their natural habitat. 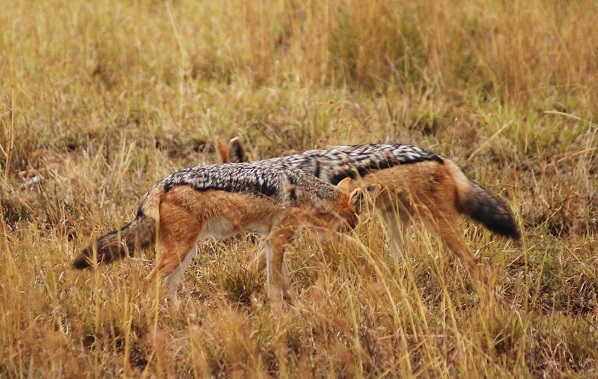 Black-backed Jackals tend to mate for life and so, should you see one in the veld, you can virtually be certain there is another in the vicinity. 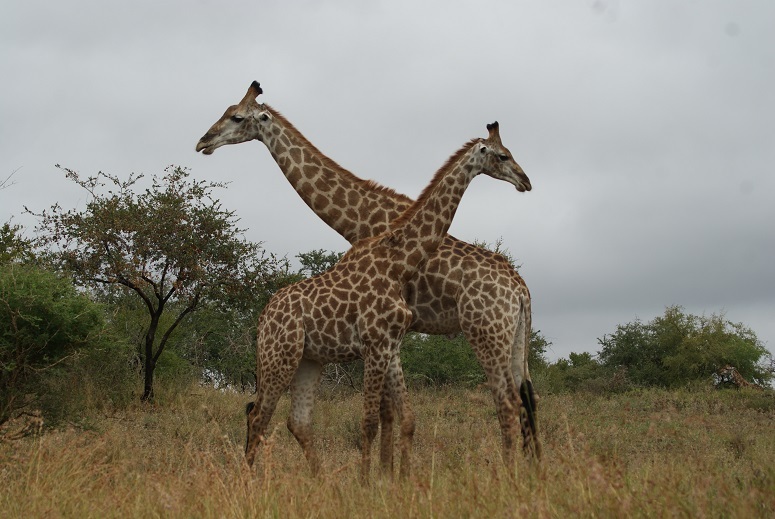 A pair of them trotted purposefully along the edge of Ghwarrie Pan shortly after sunrise one morning. 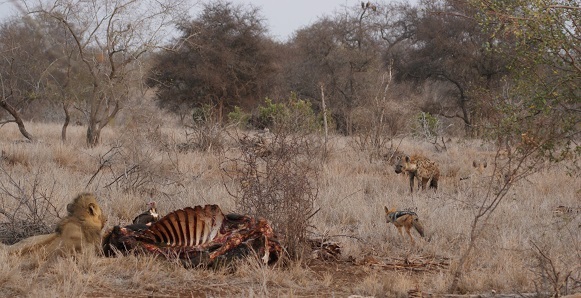 It was at Carol’s Rest though that we observed an interesting altercation between a Black-backed Jackal and a Pied Crow. 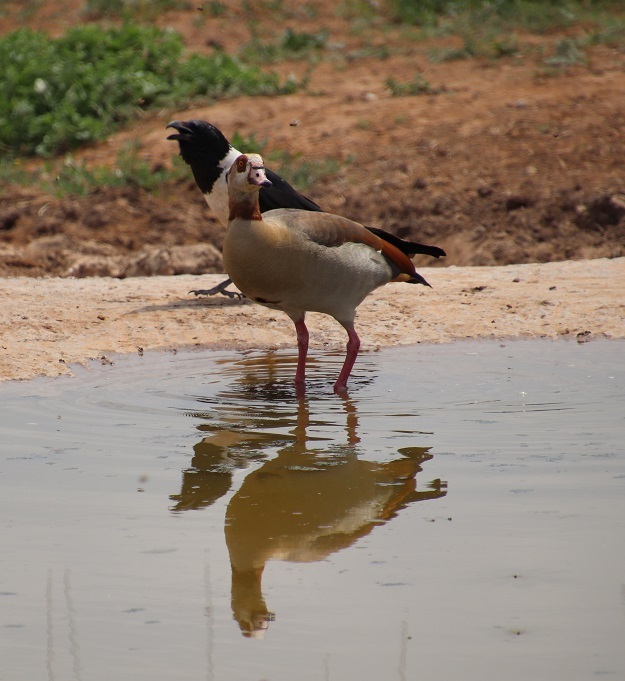 The latter had already experienced an unsuccessful attempt to share the small waterhole with an Egyptian Goose that had arrived out of the blue – with no intention of sharing the water with anyone! 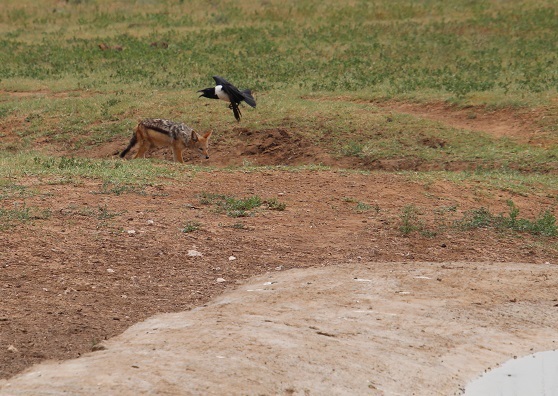 Once the Egyptian Goose had drunk its fill and flown off, the Pied Crow was in no mood to be ousted from its drinking spot again and made sure the approaching Black-backed Jackal was aware of this. 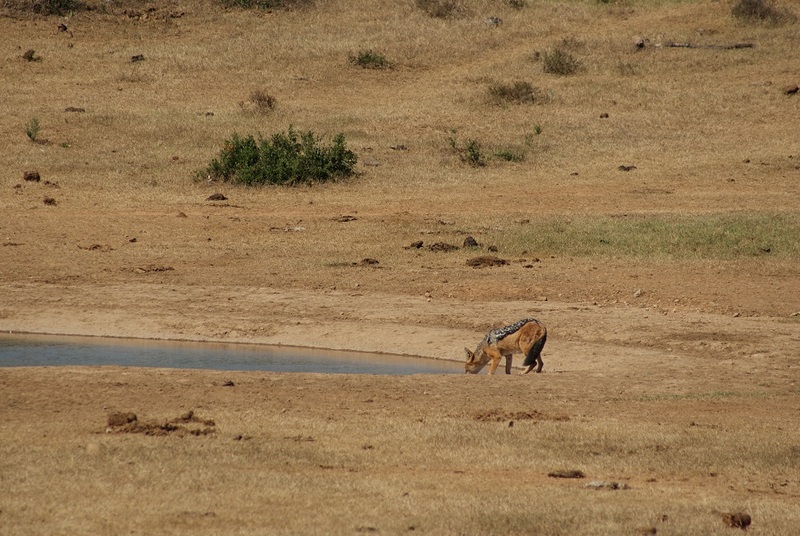 Doubtless, the jackal was thirsty too and so it kept trotting purposefully towards the water. The crow opted to make a pre-emptive strike. 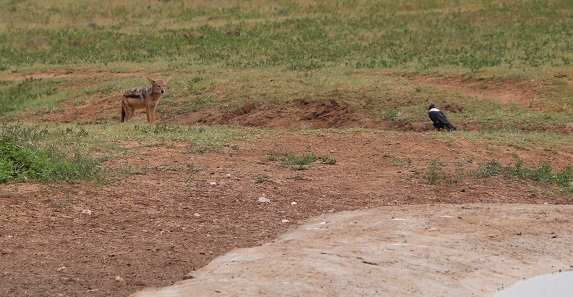 It continued to harass the jackal until it gave up and moved away to drink from the overflow a little further down the slope. 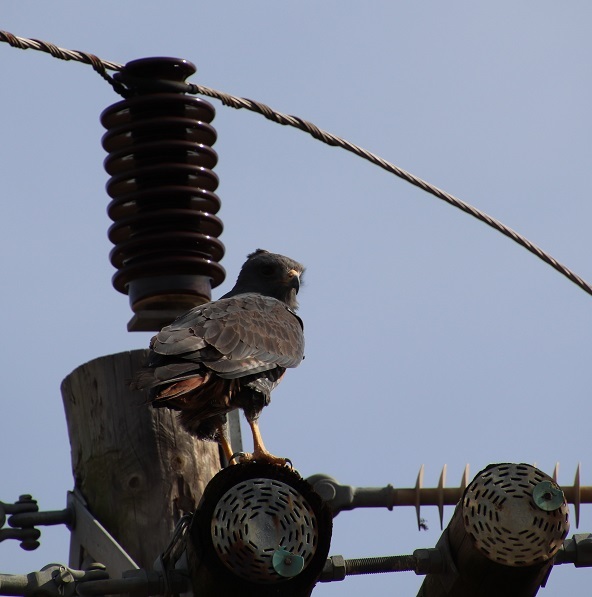 Based on its size, I think this is a young Jackal Buzzard (Buteo rufofuscus). 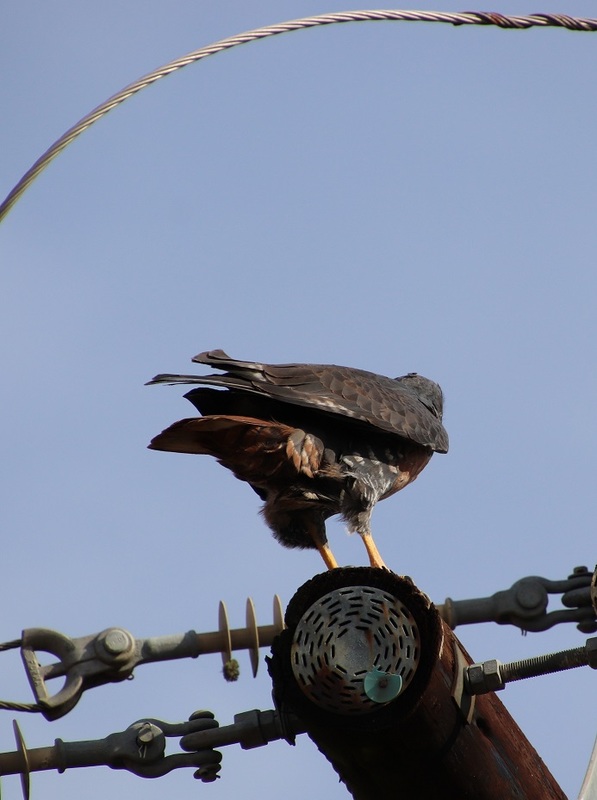 However, as you can see, this particular bird was not being particularly co-operative when I stopped to check. That it was perching against a bright sky didn’t help either! Jackal Buzzards are endemic to South Africa and, as I have recorded several of them in the area over the past few months, I think it is safe to assume this one’s identity. Unfortunately, I was unable to identify the predominantly rufous chest band on this individual. 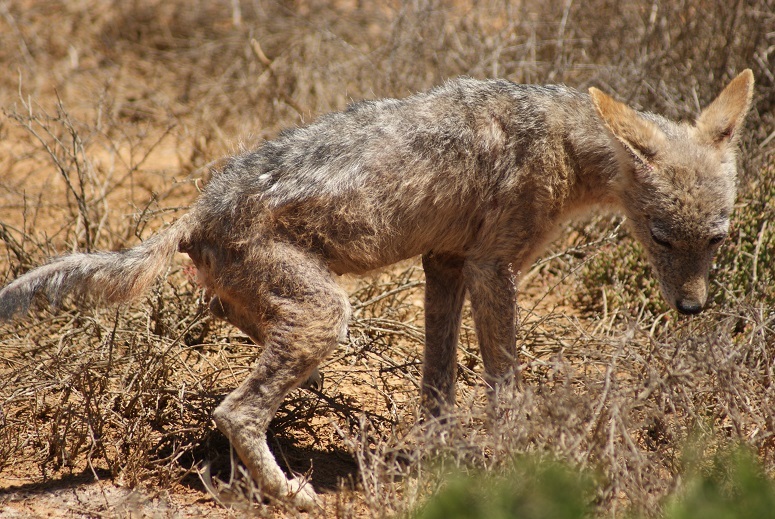 Juvenile Jackal Buzzards tend to be mostly brown in colour, with rufous on their underside and tail. This one’s tail shows the characteristic rufous colouring. The yellow legs and feet can be clearly seen. 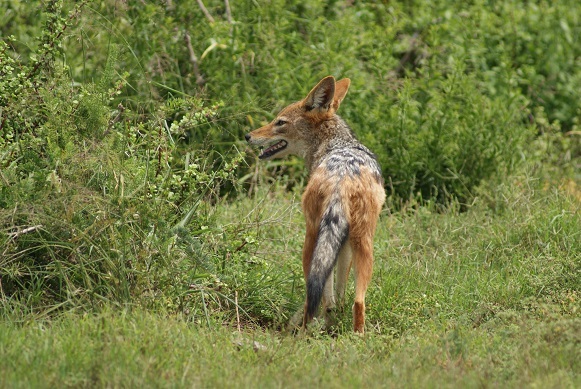 Readers unfamiliar with this bird may be interested to know that its name comes from the loud yelping calls it makes, which are similar in sound to those of the Black-backed Jackal, pictured below. 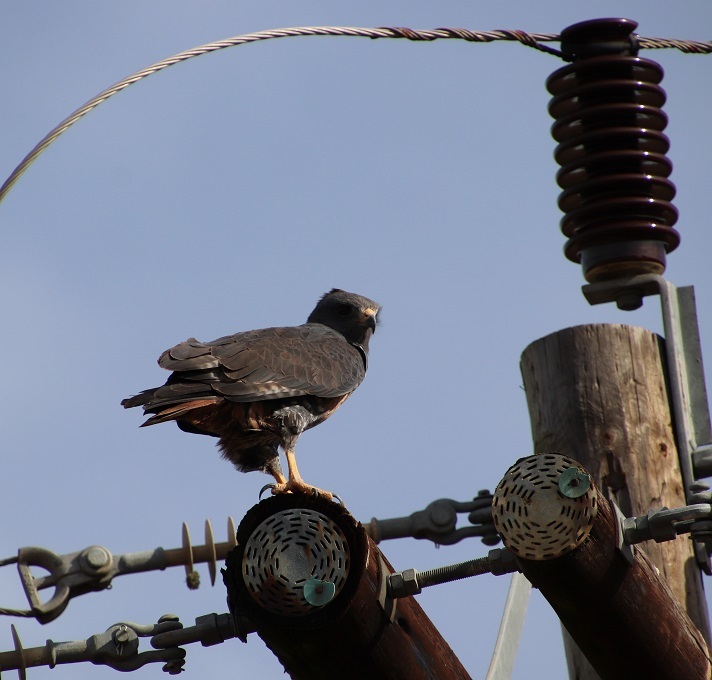 Jackal Buzzards hunt from the air and can often be seen perching on fence posts or electricity poles. 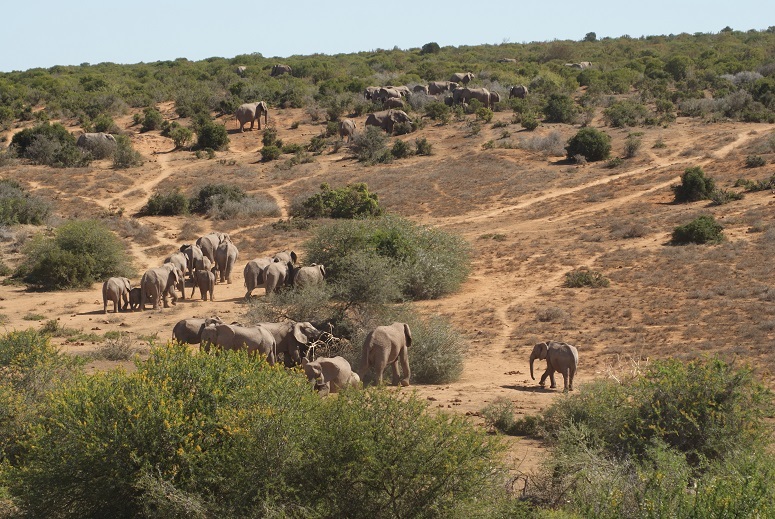 We decided to break with tradition this year and spent Christmas Day in the Addo Elephant National Park – as did hundreds of others! A long queue of vehicles developed outside the Matyholweni (meaning ‘in the bush’ in Xhosa) Gate at the southern entrance to the Park. Some people donned Christmas hats and there was an atmosphere of cheer as visitors in a festive mood greeted each other in passing. Jack’s Picnic Site was so chockful of people at noon that several families simply enjoyed a picnic lunch in the scant shade of their vehicles. Vehicles were parked as far back as the turnoff to the chalets when we reached the Main Rest Camp. The picnic site there too was filled to the brim with people braaiing or having a picnic in whatever shade they could find. Fortunately, we had booked for the 2 p.m. Christmas dinner at the Cattle Baron. The weather was gloriously clear and a pleasantly warm 23°C when we arrived mid-morning. By three o’clock in the afternoon though the temperature had soared to 40°C and a strong wind had begun to whip up the dust, so thick in places that it was often difficult to see very far. 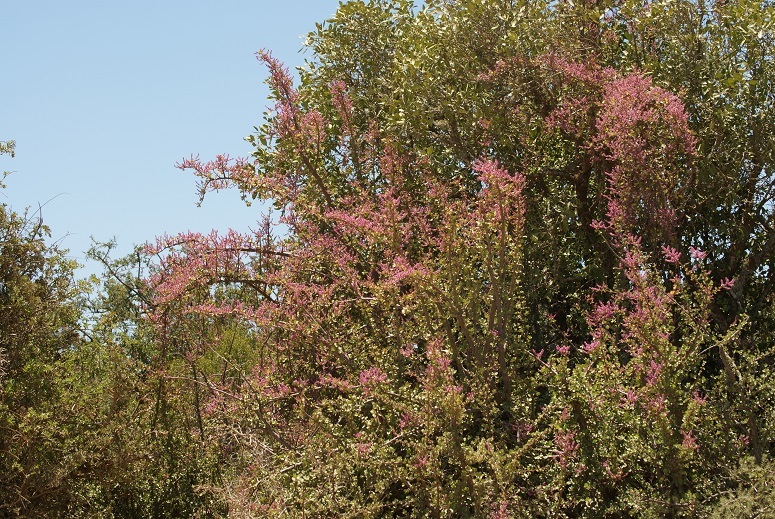 This is a good time of the year to see the Spekboom (Portulacaria afra) in bloom and we were not disappointed. 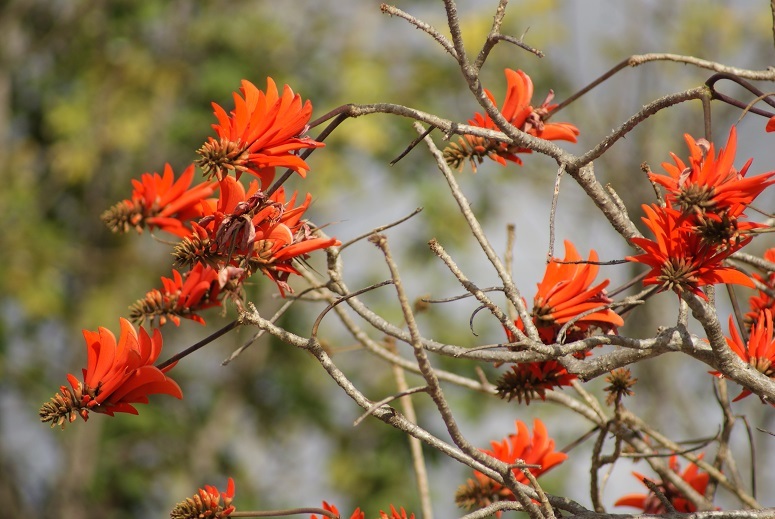 The clusters of small, star-shaped, dusky pink flowers created a wonderful display from close to the ground to the trees that had somehow managed to grow tall without being eaten by elephants. 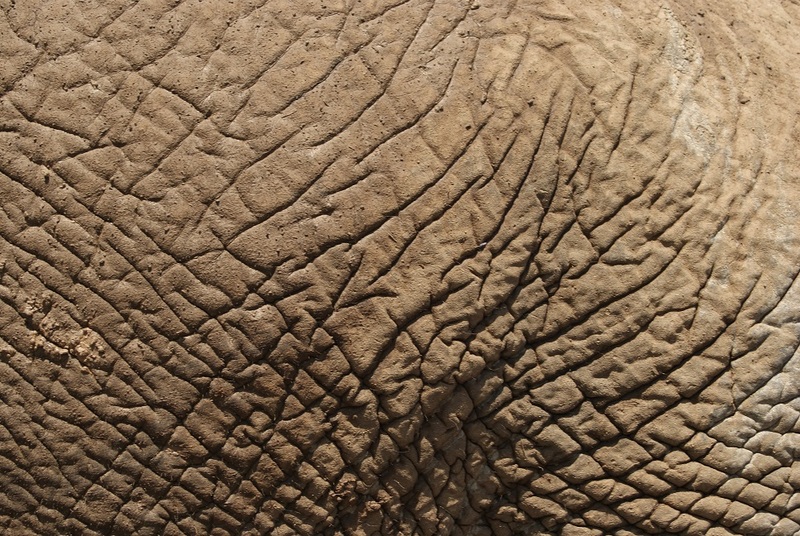 There was an abundance of the latter: we were spoiled with magnificent sightings of hundreds of elephants, mostly near the waterholes of Hapoor and at the Main Rest Camp. 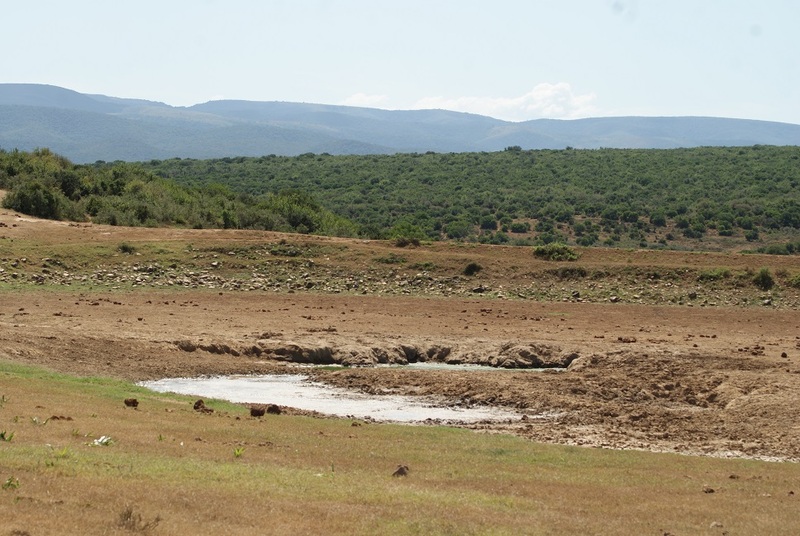 In the image below you can see a fraction of one herd moving away from the water. 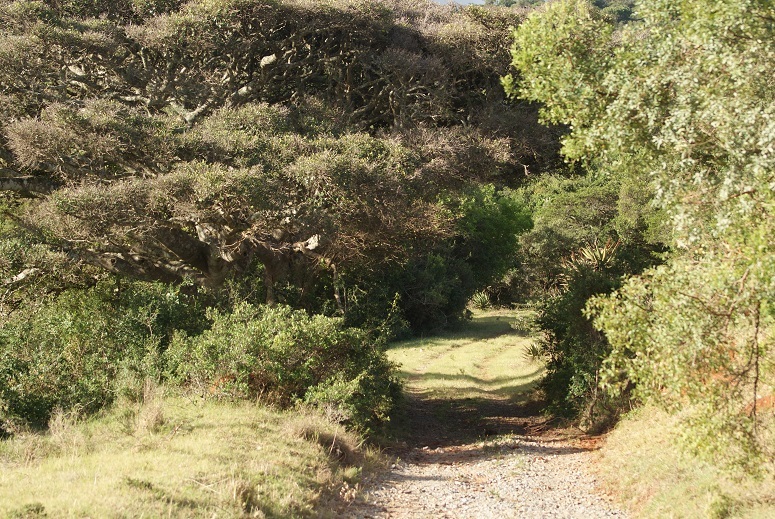 Note the paths that have been made through the bush. 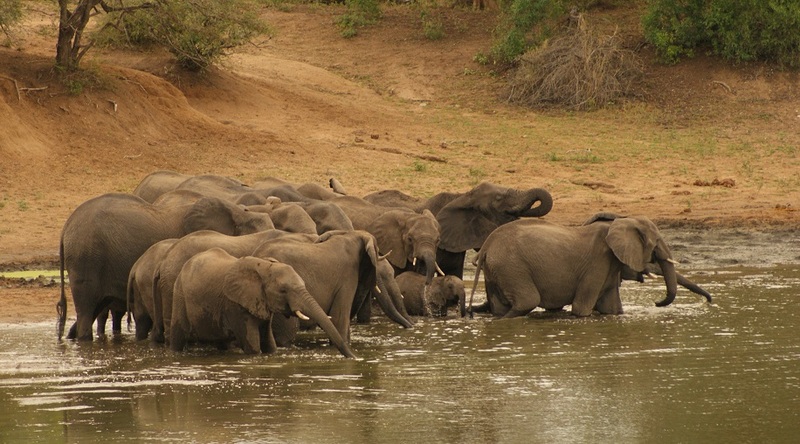 Other elephants were at smaller waterholes and allowed us very close-up views of them. 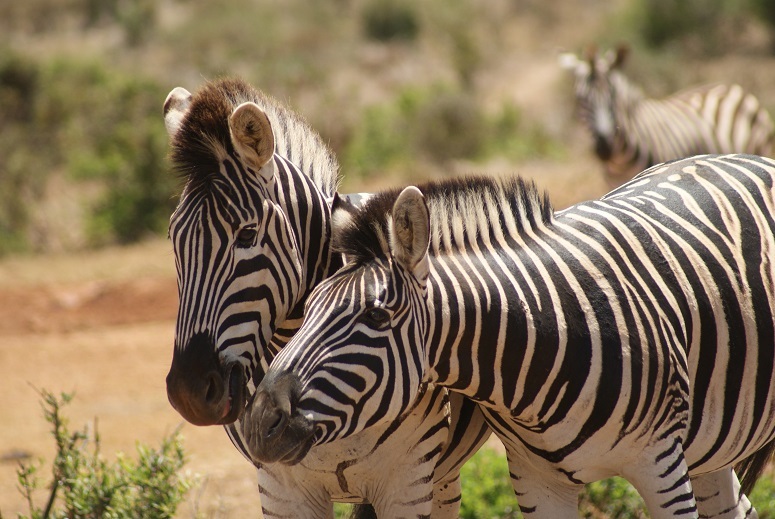 Zebras are such photogenic creatures that it is very difficult to pick out one image from the many photographs I took of them. 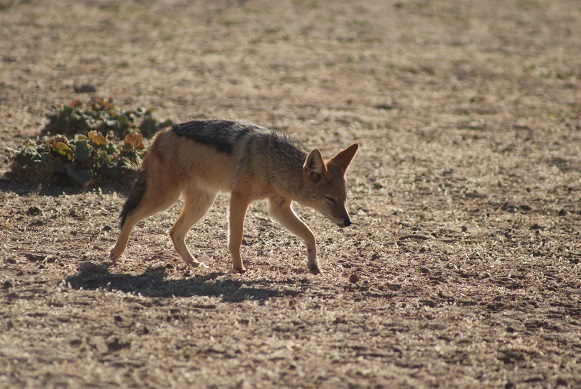 Given the heat and the prolonged drought, it was very sad to see this mangy black-backed jackal making its way through the dry grass. This disease is caused by mites (Sarcoptes scabiei) burrowing into the skin to complete their lifecycle. 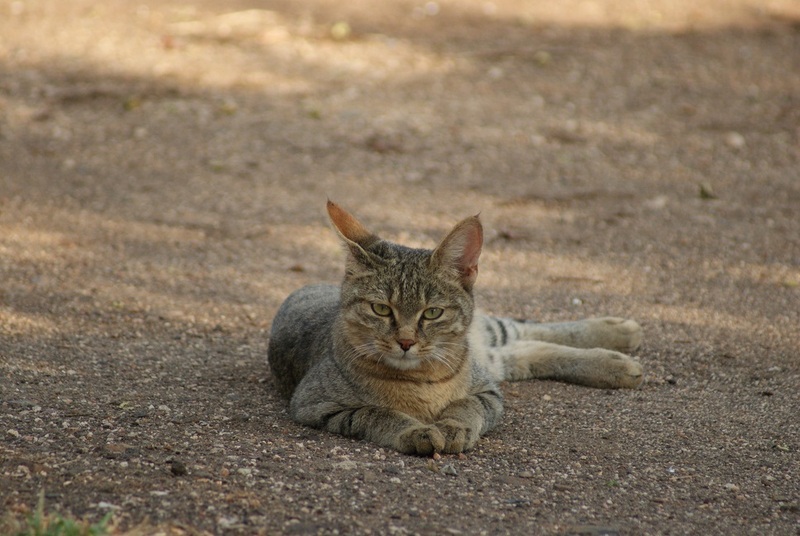 The condition may become chronic and eventually leads to the death of the animal in the wild. 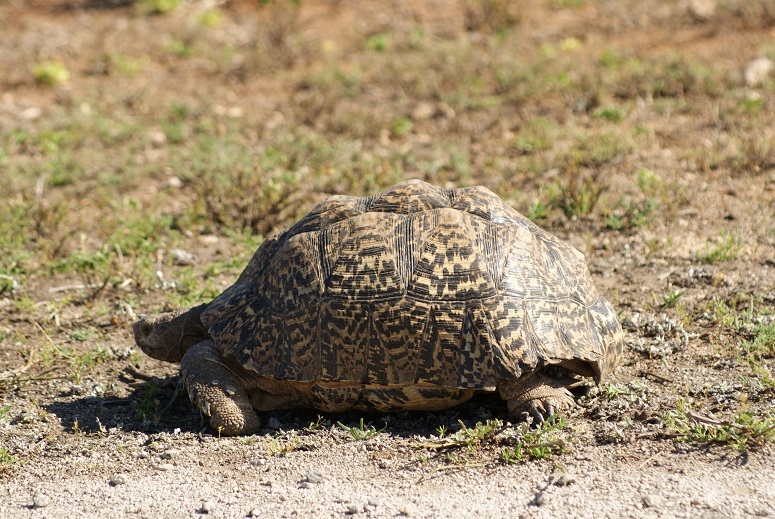 On a much more cheerful note, we saw this very attractive mountain tortoise next to the road as we were heading home at the end of an interesting Christmas Day. Three years ago we enjoyed the two days spent camping in the Satara camp so much that this time we booked to stay there for a whole week. 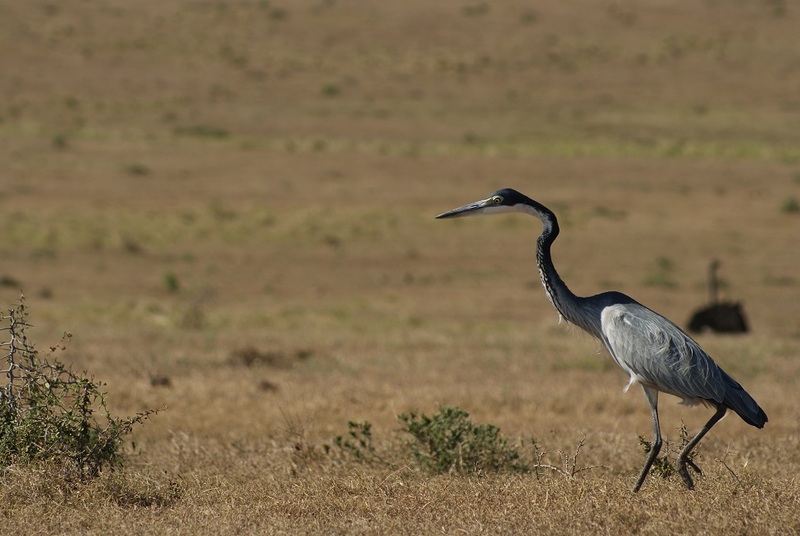 The game viewing in that area is excellent with a variety of drives to choose from and a bonus is that the bird life within the camp is prolific. Then we had a Scops Owl roosting in a tree right next to our tent – this time there was a resident African wild cat, but more of that later. 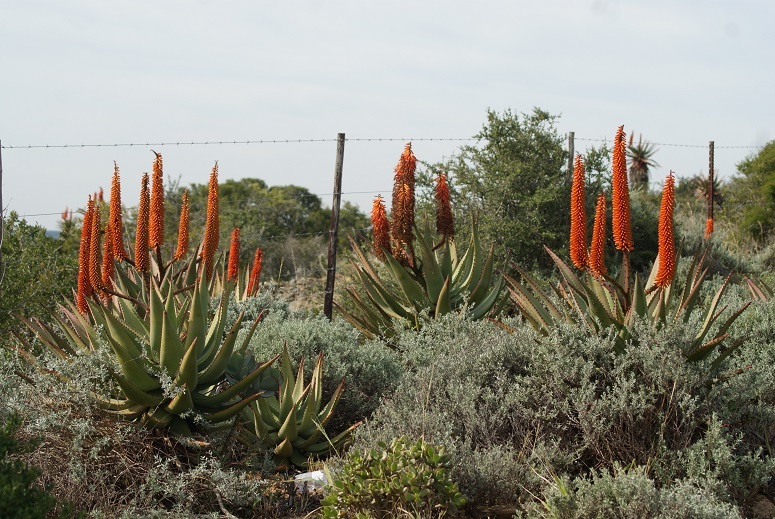 It is a complete change from urban living and sheer bliss listening to the whoop of hyena and the chorus of the high-pitched eerie calls of black-backed jackals at night, not far from the perimeter fence. A terrific thunderstorm broke the intense heat of our first night in Satara: sheet lightning, thunder and rain accompanied by strong wind that buffeted our tent until the early hours of the morning. The rain continued intermittently for several days after that, leaving everything from tents to birds looking sodden. The African wild cat I mentioned earlier briefly sought shelter from the rain under a trailer net to our campsite, where it leisurely cleaned itself before disappearing. It appeared sitting under our truck a few days later – this time possibly seeking shelter from the sun – then settled into a clump of bushes next to our tent. It must have made this part of the camp its home, for we later saw it lying comfortably in the dust unperturbed by the human activity around it. 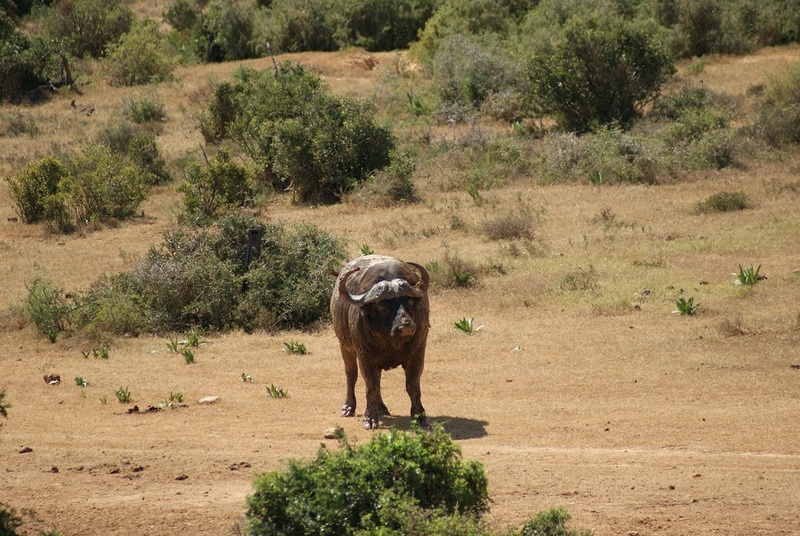 We saw large herds of both elephant and buffalo soon after entering the Kruger National Park through the Orpen Gate. 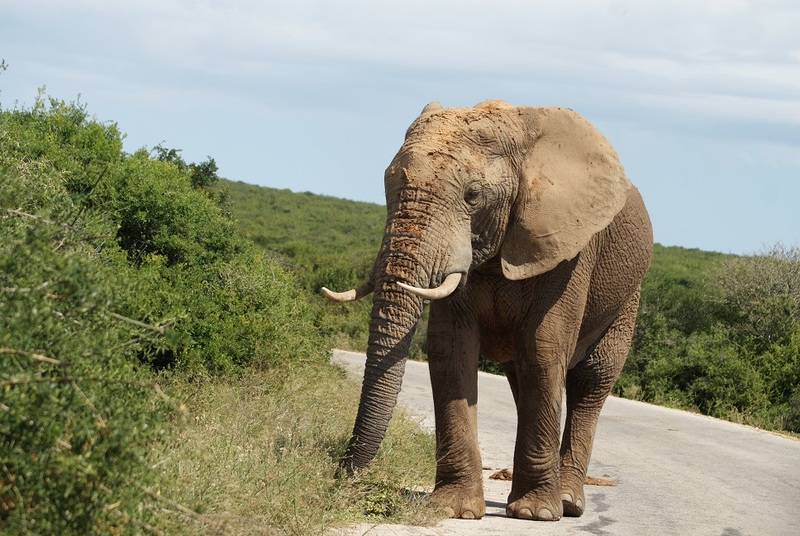 As the elephants here have a reputation for being more aggressive and temperamental than the ones we are more familiar with in the Addo Elephant National Park – not that we witnessed any evidence of this – we nonetheless kept our distance from them and the engine running. 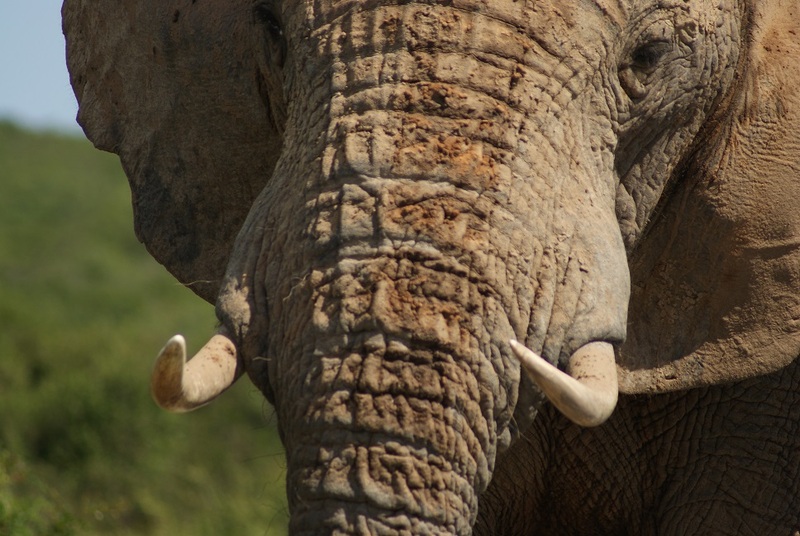 A few days later we watched a herd of about fifty elephants gather at Nsemani Dam on the Orpen road – they are fascinating creatures to observe. 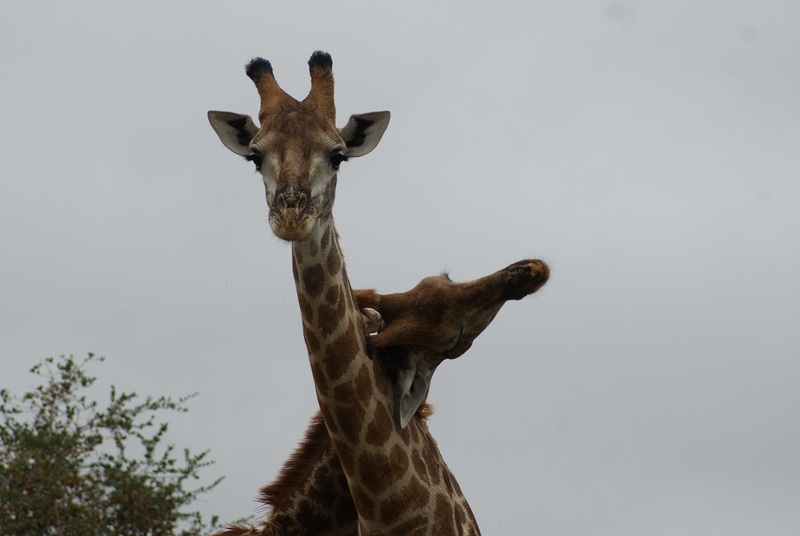 Several groups of them seemed to merge and separate in a prolonged ceremony of greeting: youngsters tussled with each other while small babies kept close to their respective mothers in that mass of enormous legs and swaying trunks. 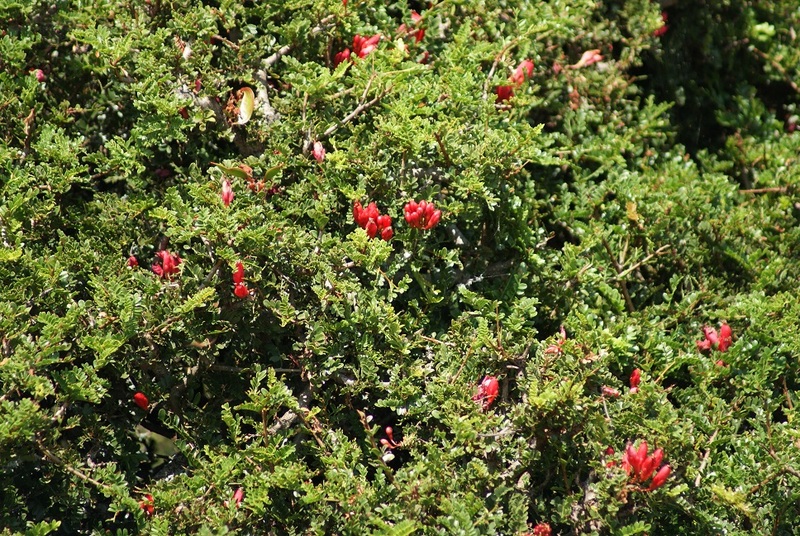 One group eventually parted from the rest and were quickly absorbed by the surrounding bush. The others edged along the dam to drink and it wasn’t long before a number of them had waded right into the water to drink and splash about. 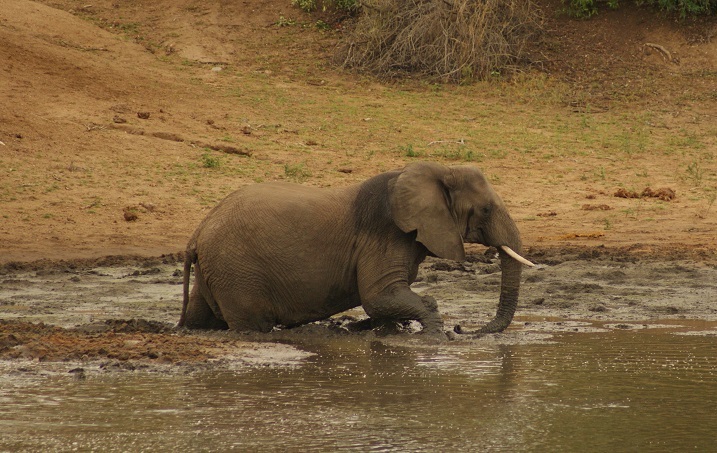 A sudden loud trumpeting from the matriarch caused all the elephants to leave the water obediently and in a hurry to stand on the bank – bar one that had got stuck in the thick gooey mud. 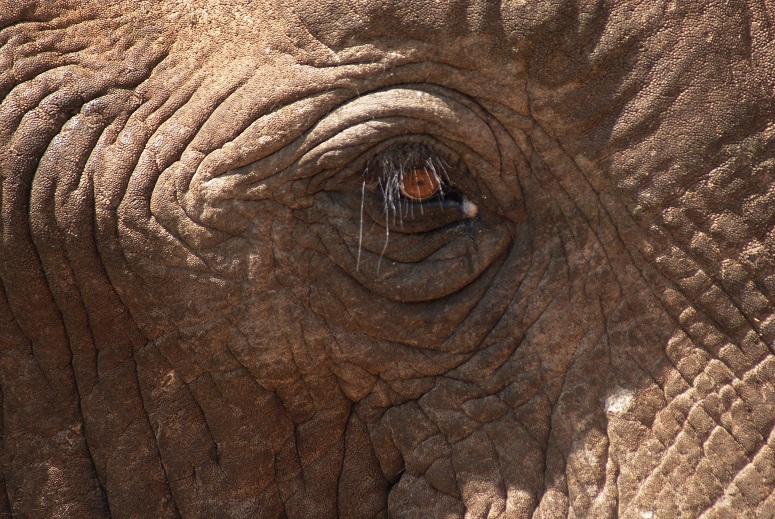 My heart lodged in my mouth while the hapless elephant tried lifting first one foot and then the other without success. Its companions remained silent and watchful; some had even turned away from the distressful spectacle. At last the elephant turned around about 90 degrees and tried again. First it managed to free the front legs, then, scrabbling for a foothold in the knee-deep mud, it pulled one back foot free. To my immense relief it broke free shortly afterwards and made for the bank. At that point the waiting elephants moved off while the now freed elephant struck off on its own on a path parallel to the herd. 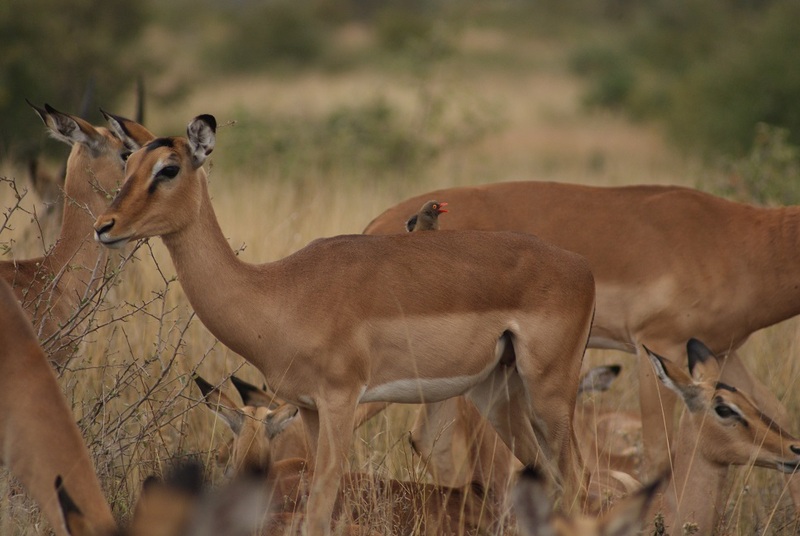 Unsurprisingly, impala were the first animals we spotted on entering the park. 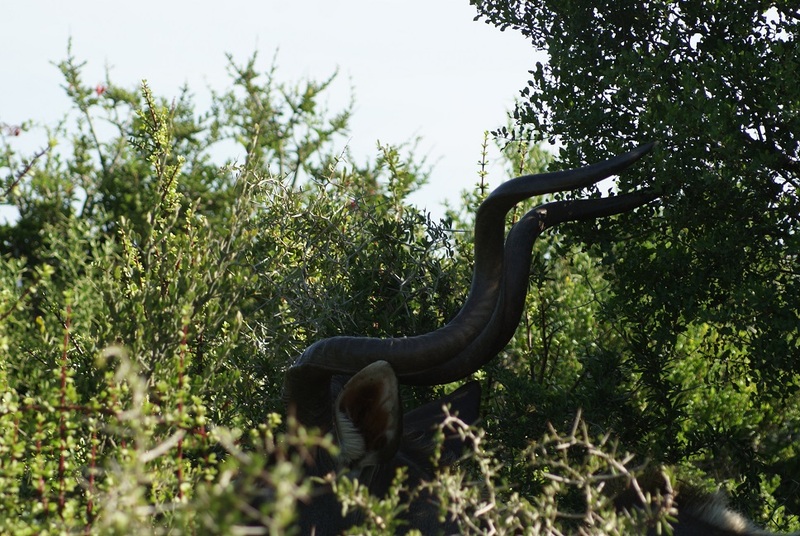 These mixed-feeders were described by the guide on a later night-drive as “the McDonalds of the park” as they provide food for most of the large carnivores. They are beautiful animals to watch closely, being rufous-fawn in colour with white underparts and delicate markings. It is the rutting season now and we often observed the dominant male chasing after his chosen female – snorting loudly , while she lead him a merry dance by running in circles through the veld with him in hot pursuit. 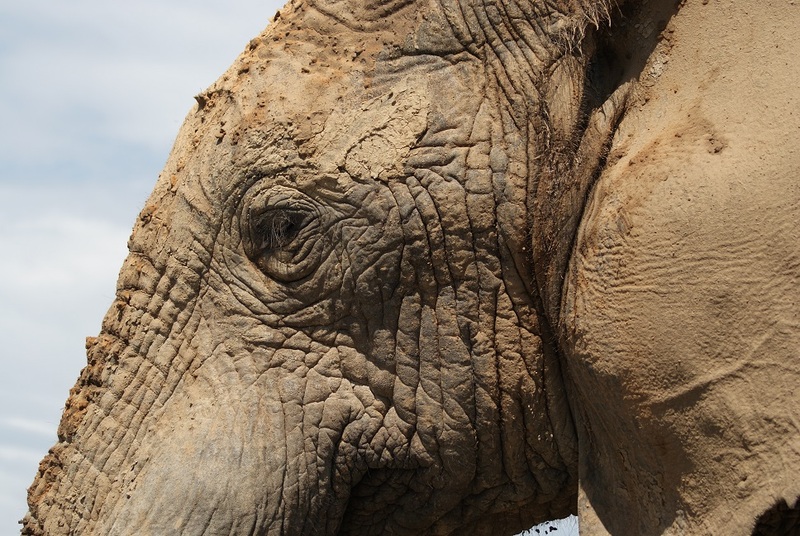 The ferocious sound of that snorting reminded us of a night, many years ago, when we were stranded in the veld in Botswana and – not having heard it before – were concerned that the noise we were hearing came from something that might decide to eat us! 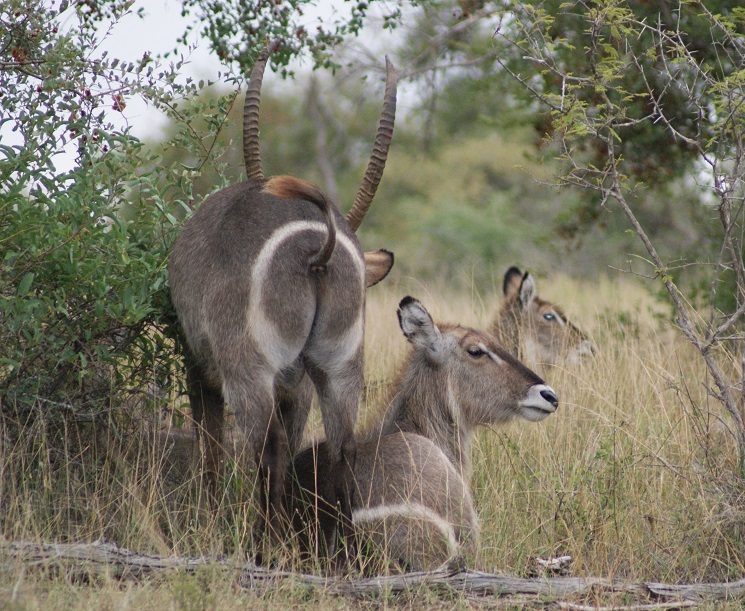 On one occasion we watched several female waterbuck lying in the grass chewing the cud while the male gave them the once-over. Each obediently rose in turn when sniffed by the male and lay down again. Nsemani Dam proved to be a wonderful place for watching hippos: blowing water in sprays from their nostrils; making their characteristic grunting sounds; squaring up to each other with their mouths open – South Africans of a certain generation will always associate that wide-mothed pose with an advertisement for Chomp chocolates. 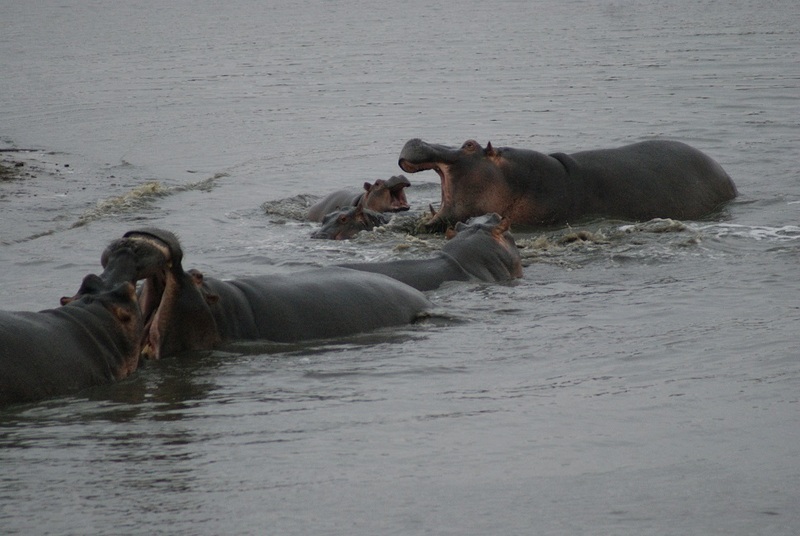 Hippos are so interesting out of the water too, when one can see how large and cumbersome looking they are. Several had small calves in tow. 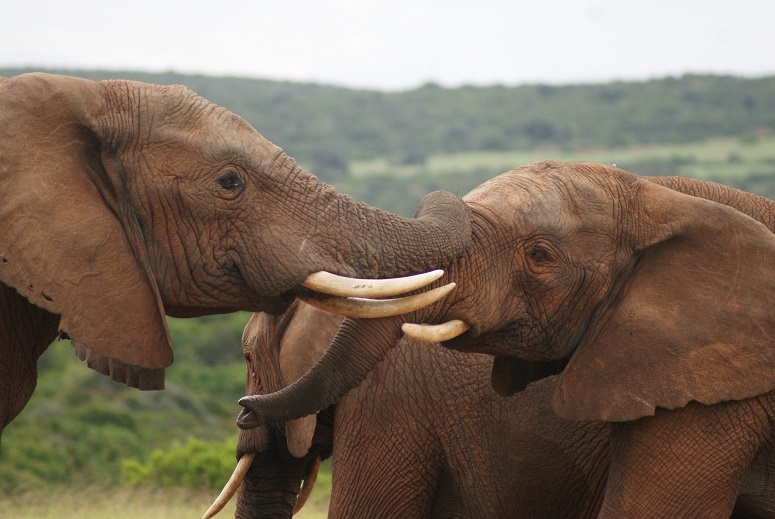 Like baby elephants, these look cuddly and so ‘touchable’! 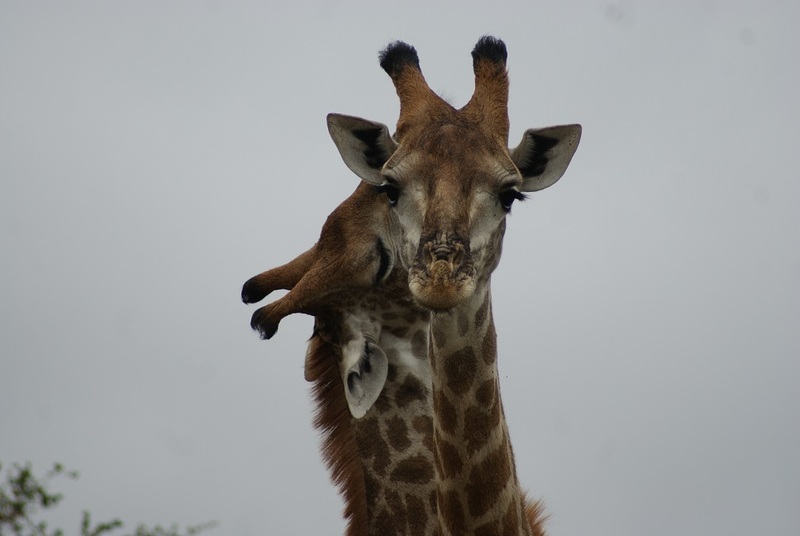 Game viewing was good, even during the inclement weather. Once we saw a lioness followed by six cubs cross the road and on another occasion spent nearly two hours watching five sated lions sleeping off their meals from the night before. Every movement they made, from lifting a head or drinking water, seemed an effort for they would flop down again or roll over, stretching languidly and relax once more. 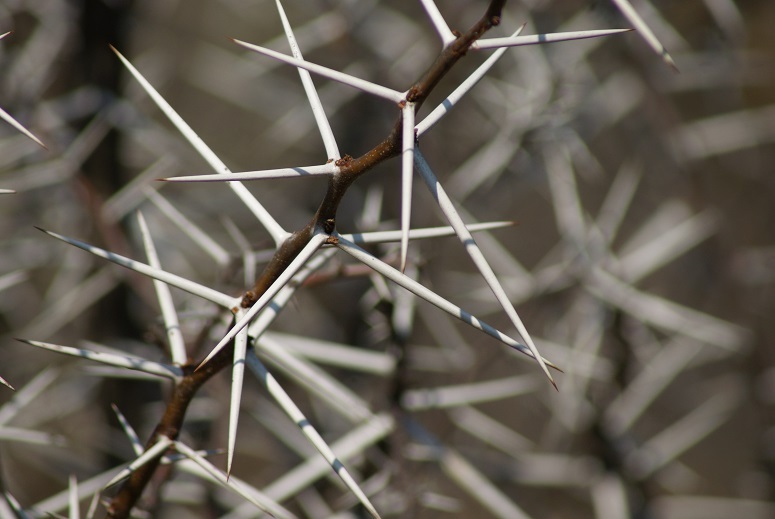 Although signs in Satara Camp warn visitors to watch out for honey badgers (more commonly known as ratels in South Africa), we never came across them there. Early one morning though, we saw three of them trotting through the damp grass not far from the camp. 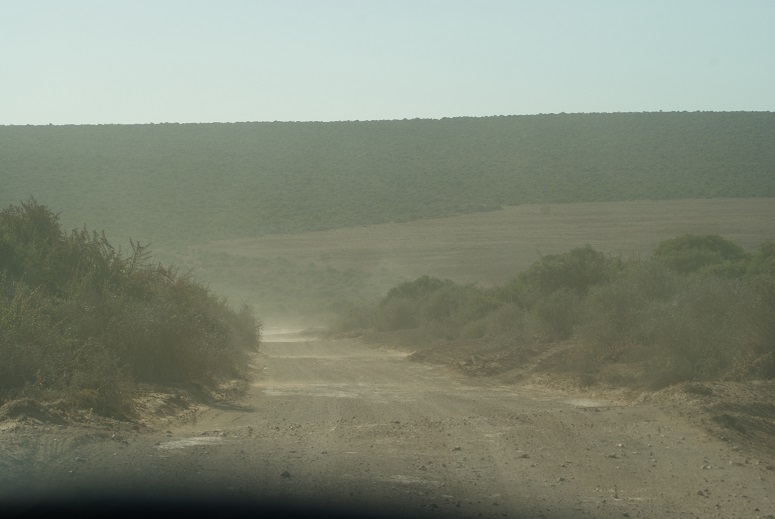 It was a privilege too to spot two black rhinos close to the road – not for long though as they soon moved through the bush and out of sight. 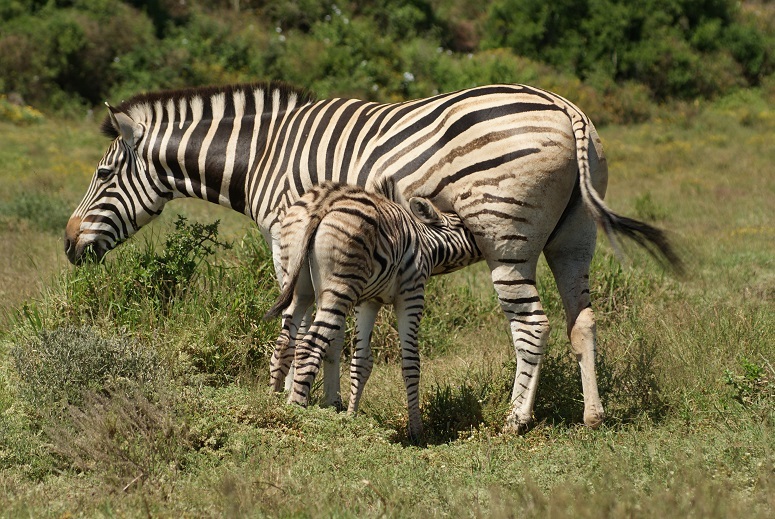 So much game viewing depends on the luck of being in the right place at the right time. 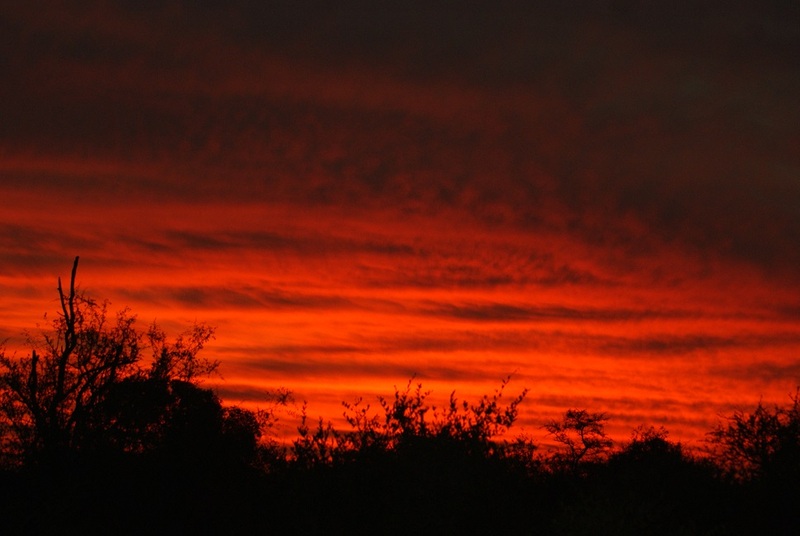 After the rain of the first few days, it was wonderful to experience the sunshine again and to witness some glorious sunsets. 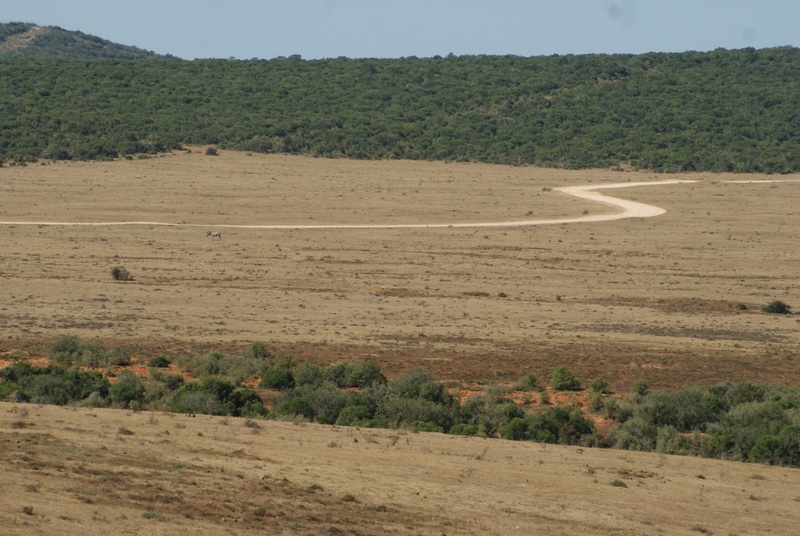 The Addo Elephant National Park is dry: not just brown and dry – in places it looks desiccated dry. Some Schotia brachypetala, plumbago, verbena and pelargoniums make a brave show of their blooms in the swirling dust. 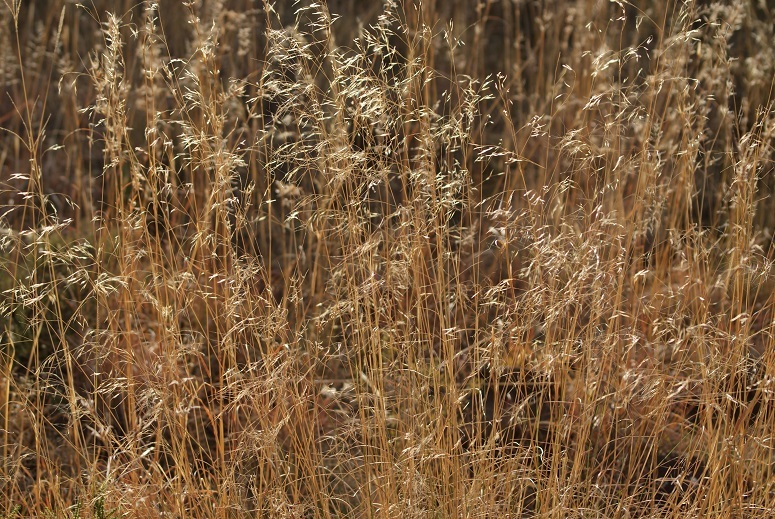 From a distance too some of the grassland areas look potentially attractive for grazers until one sees the bare patches from close up. The only vestiges of green show where there has been some water run-off from the road. 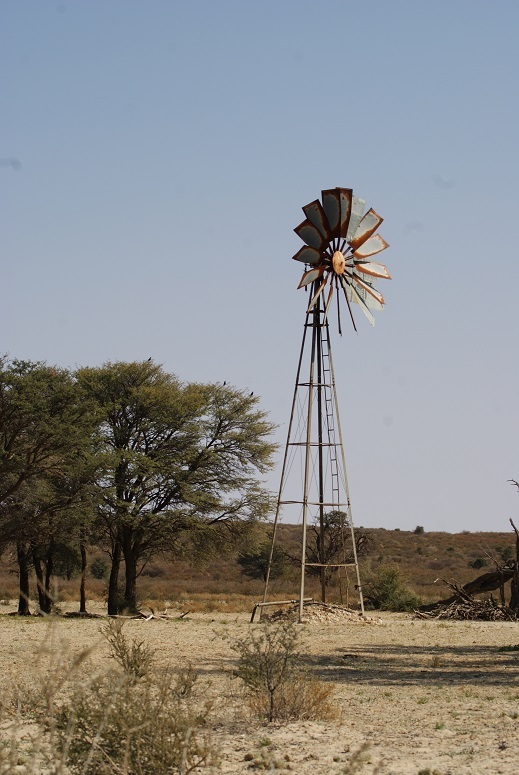 Even some of the waterholes, such as Rooidam, are virtually dry. 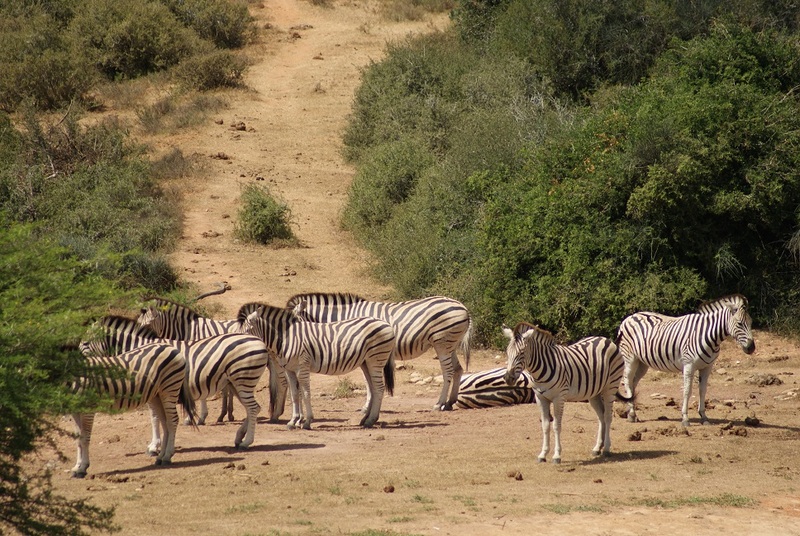 A small herd of zebras were the first animals we encountered. Photogenic creatures that they are, they formed the subject of several photographs before we moved on. Little did we realise then that we would see hundreds more before the day was over! 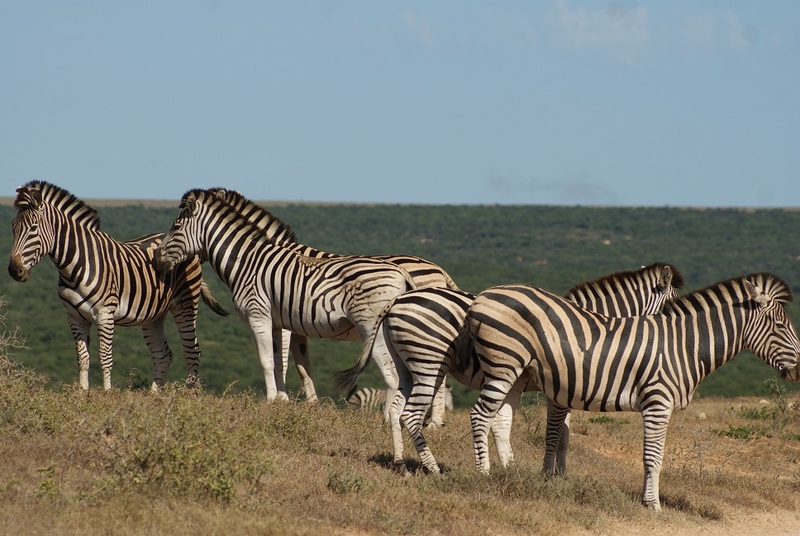 Zebras are so beautiful to look at and they turned out in full splendour, giving us the opportunity to observe – from close quarters – the variations in the patterns of their stripes. Some are broad and bold, while others are paler and thinner. 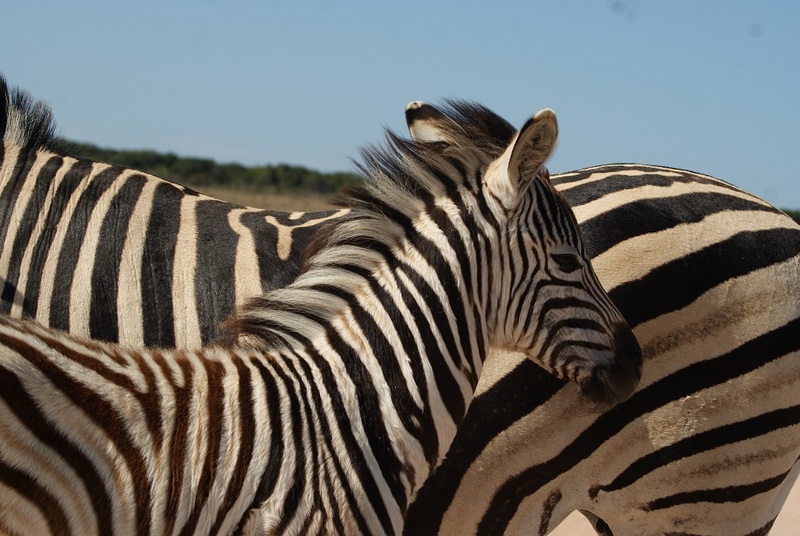 Some stripes are well defined all over the zebras’ bodies, while on other animals the stripes peter out to almost nothing. 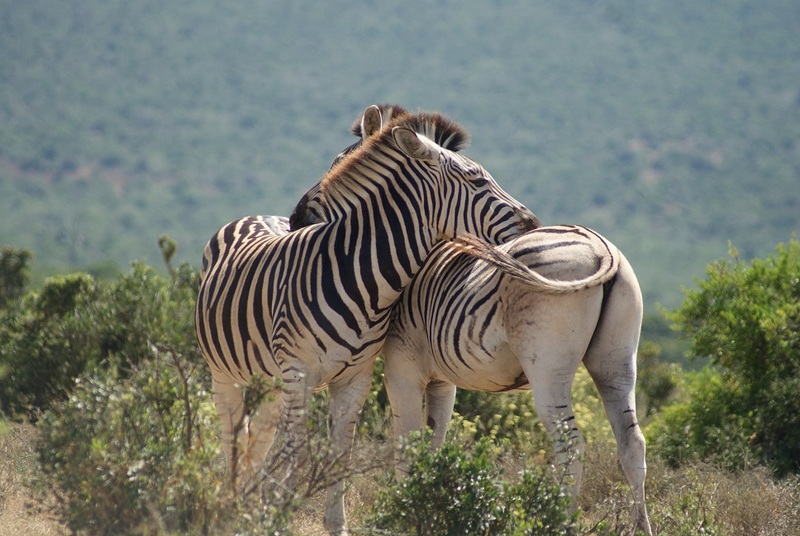 It seemed to be ‘necking’ season for all over we came across zebras resting their heads on each other as if in a show of affection. A number of foals were evident too. Their furry appearance a stark contrast to the sleekness of their elders. 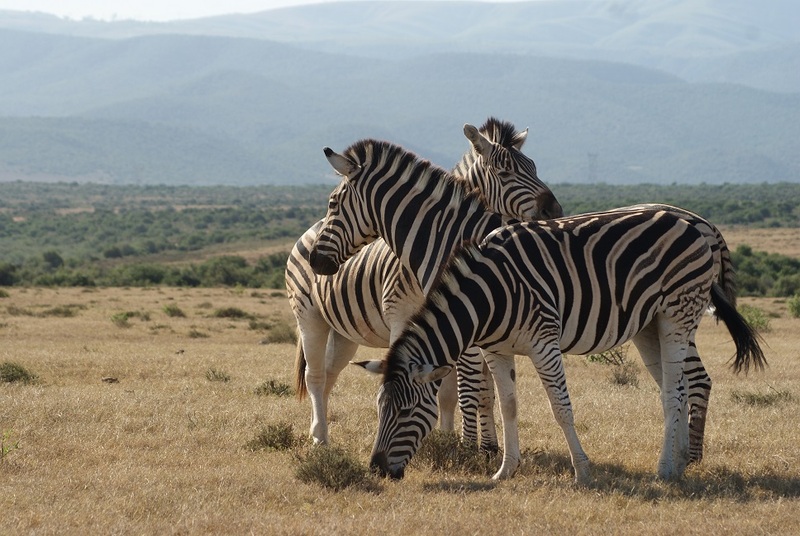 Zebras won the day for their dominance in the veld. Warthogs came a close second. 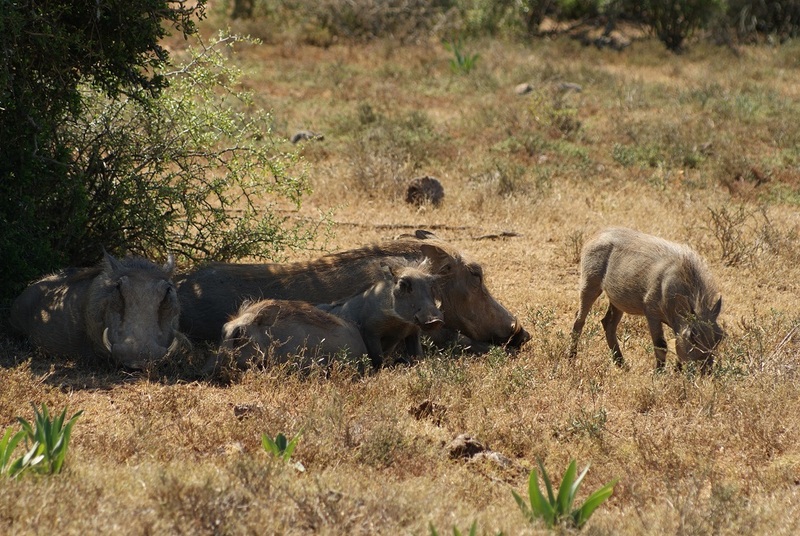 Family groups could be seen from far away, close to the road, in the sun, or resting from the 28°C heat in the shade. 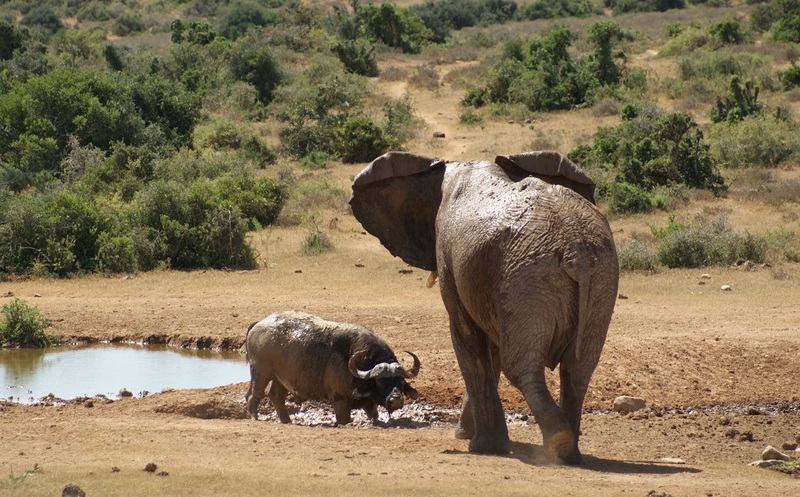 Although we were told of a large herd of elephants at Hapoor waterhole, we saw only single ones. One elephant walked resolutely towards our car, almost brushing past it within touching distance. A few kudu were visible in the bush. The bulls appeared to be skittish, however, and moved into cover upon the arrival of any passing traffic. 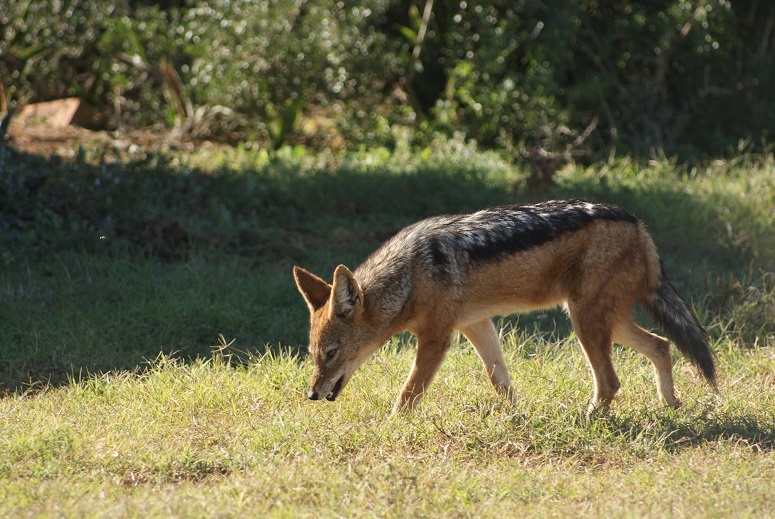 It was a treat being able to watch a black-backed jackal drink her fill from a waterhole, taking her time before trotting off purposefully as if she had a mission to fulfil.Other animals we saw were a suricate, eland and hartebeest. 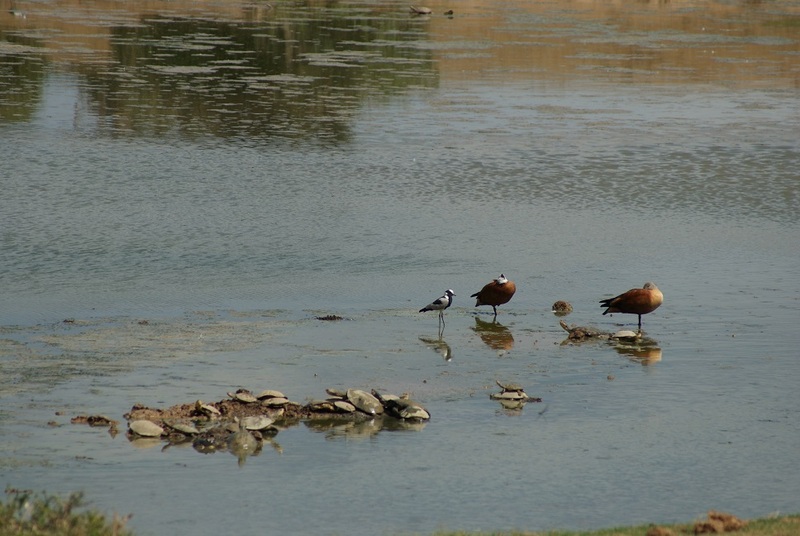 Ghwarrie dam is always a favourite place to visit and, although there were no animals other than warthogs this time, there were terrapins galore as well as South African Shelducks and Blacksmith Plovers. 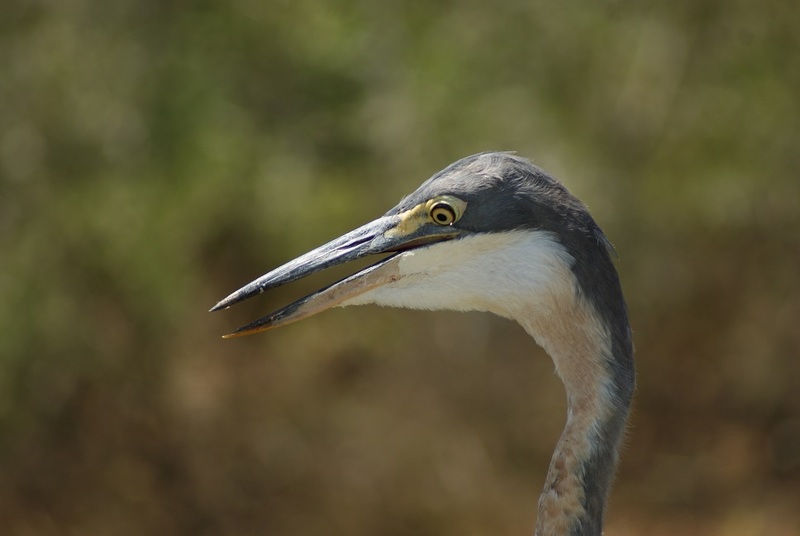 Both Grey- and Blackheaded Herons showed their willingness to be photographed by standing close to the road, their eyes intent on a possible meal. A gusty wind sprang up in the afternoon, showering us with dust and fine grit. Clouds were starting to gather and it was, sadly, time to leave. 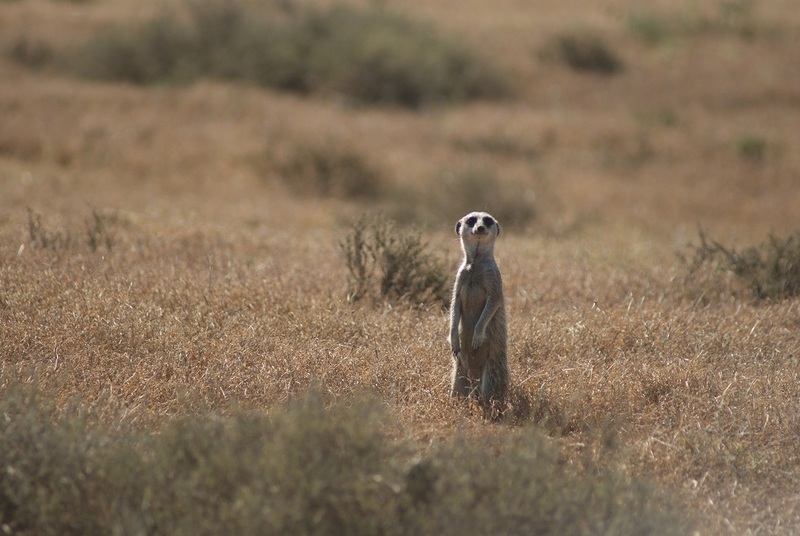 The last animals to be spotted at Domkrag? 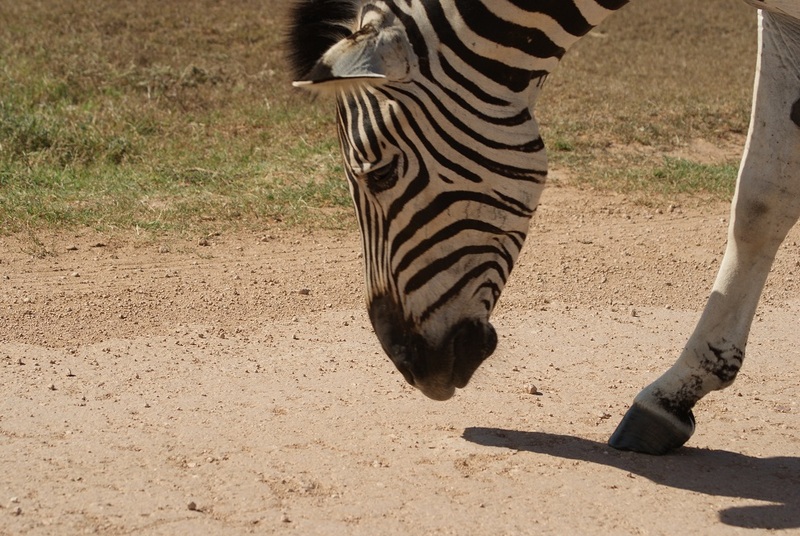 Zebras, of course!